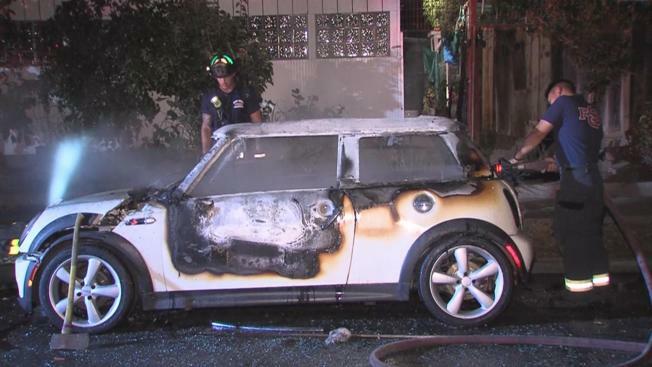 A Mini Cooper was lit on a fire Sunday morning in San Jose (September 11, 2016). Recently released surveillance footage captures the moment when an arson suspect lit a car on fire early Sunday in the South Bay. The hooded suspect was caught on camera lighting a Mini Cooper on fire in San Jose before sprinting to a waiting car and taking off. A neighbor shared their surveillance footage with investigators who are currently looking into the fire, which occurred just before 3 a.m. near the the intersection of Keldon Drive and Kelson Court, according to fire officials. The car fire was extinguished in a matter of minutes once fire personnel arrived on scene, but the vehicle was badly damaged, according to fire officials. San Jose Fire Department investigators are working to contact the owner of the Mini Cooper, according to fire officials.